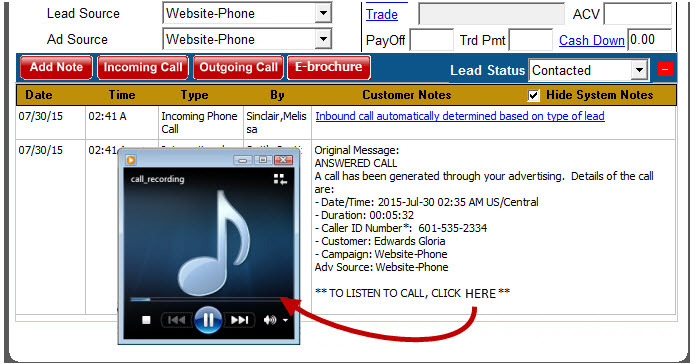 Every new incoming sales call will automatically create a new prospect, including voice files, and proper lead source within ProMax. The difficulty of manually creating new customers or the days of your reps not logging all their ‘ups’ can be a thing of the past. The ProMax message center alerts you of any new or missed calls which allows for immediate follow up. You can also being notified via your email of new calls, voice mails, or missed calls. To make things easier to manage and avoid convolution, repeat callers are automatically detected therefore eliminating duplicate leads within ProMax. Directly within ProMax is all your Call Manager analytics. This allows for easy access to a plethora of valuable information. We understand dealerships are tired of using multiple systems. ProMax’s Call Manager integration makes it is a simple as can be but at the same time unbelievably effect.